First United Methodist Women’s annual Holiday Fair will be from 8 a.m. to 2 p.m. on Saturday, October 20 at 516 Kellogg Ave. in Ames. 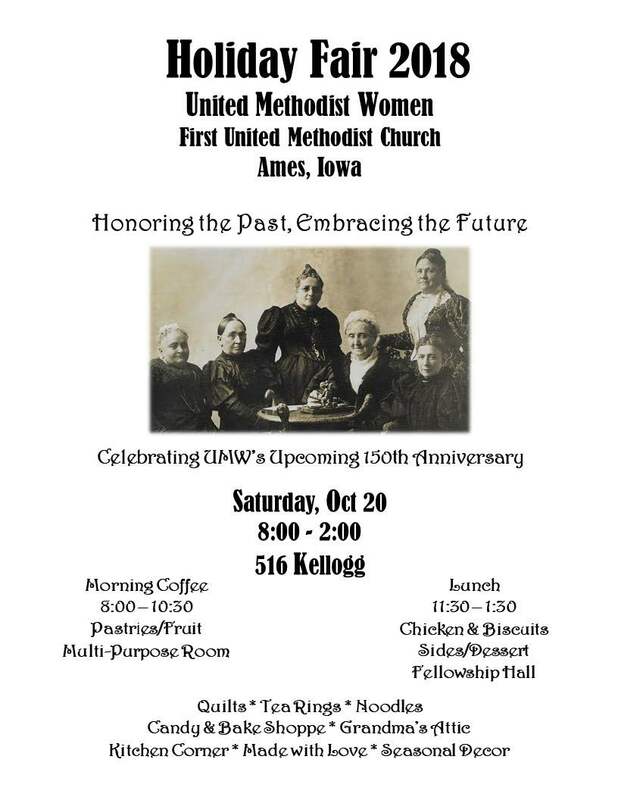 Ames First UMW unit is part of United Methodist Women, now celebrating 150 years of service to women, children and youth locally and around the world. While this event is sponsored by the United Methodist Women, the Fair is made possible by the whole church family. Morning coffee will be from 8 to 10:30 am in the second floor Multi Purpose Room for a free will offering. (Elevator available) The Bake Shoppe will be open from 8am-2pm and will include a great selection of homemade pies as well as breads, cookies, candies, cakes and bars. Homemade noodles and tea rings will be sold in the Bake Shoppe, next to the Multipurpose Room. Other rooms will be offering a wide variety of items for sale. Grandma’s Attic will feature antiques, special dishes, collectables, linens and jewelry . Kitchen Corner will have a wide variety of new or gently used every day dishes, kitchen décor, aprons, towels and kitchen gadgets. The popular Seasonal Room will return and will feature many seasonal decorations and décor. The Made With Love room will be located in the Conference Room near the south entrance and will showcase handmade items such as purses, scarves, aprons, and jewelry. There will be a number of beautiful handmade quilts available in the Quilting Room. There will also be seasonal table runners in this room. All quilts will be available by silent auction. A lunch will be served from 11:30-1:30 featuring Chicken and biscuits, sides, dessert and beverage. Cost for lunch will be$8, $4 for children under 12 with a vegetarian option available upon request. Take-out option will also be available. For more information call the church office at 515-232-2750. Please put October 20 on your calendar and join us to kick off your holiday season.